New BMX X7 On Its Way? The BMW X5 was the first SUV the German automaker launched when it first debuted in 2000. Since then the automaker has expanded its lineup to include the X3, X6, and forthcoming X1 subcompact SUV. 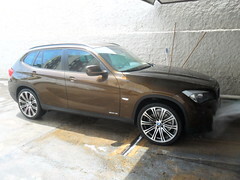 BMW is missing a 7-seat SUV in its lineup but that may be about to change, as by 2015, the BMW X7 should come to market. According to Automobile, BMW is planning on building the X7 model to compete against three row luxury SUV rivals such as the Mercedes-Benz GL and forthcoming Audi X9. The Audi Q7 is also a 7-seat SUV. Other competitors include the Volvo XC90 and Lexus GX460. In 2008, in the face of an economic recession in the U.S. and Europe and a steep drop in SUV sales, BMW dropped plans to build a 7-seat SUV model. However, with the economy improving and more fuel-efficient engine technologies, BMW is moving forward with plans to build its largest SUV ever. BMW is well known for its spirited engines. This extends to its SUV lineup. According to BMW, the X5 xDrive35i has a 0-60 time of 6.4 seconds. The X5 xDrive35i comes standard with a 3.0-liter 300 horsepower turbocharged V6 engine. 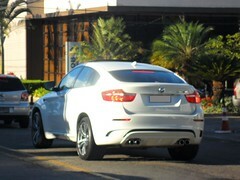 A new twin-turbocharged 5.0-liter 400 horsepower V8 engine is offered in the xDrive50i trim. Both of these engines come with an eight-speed automatic transmission. For even more power, BMW offers a 4.4-liter 555 horsepower V8 engine in the X5 M, which has an MSRP of $85,700. At this price point, a navigation system comes standard and fuel economy of 12-mpg city and 17-mpg highway should not be a concern. For fuel-efficient minded drivers, BMW offers hybrid and diesel engines in its SUV lineup. The BMW X6 ActiveHybrid, which is a coupe-like SUV, comes with a 4.4-liter 400 horsepower V8 engine paired with a hybrid drive. Its fuel economy is rated at 17-mpg city and 19-mpg highway. The diesel BMW X3 xDrive35d gets 19-mpg city and 26-mpg highway with a 3.0-liter 265 horsepower V6 engine producing an impressive 425 pound feet of torque. The X3 xDrive35i gas engine is rated at 16-mpg city and 23-mpg highway. Buyers can expect much of what is seen in the X5 in the upcoming X7. In the meantime, there are a variety of luxury 7 seat SUV models to choose from or qualified buyers can pick select X5 models with 2.9% financing for 24-36 months through May 31, 2011. A lease special of $619 per month is also being offered. See BMW’s website for all the details. Hyundai Santa Fe vs. Santa Fe XL: What’s the Difference? Mitsubishi Outlander vs. Mitsubishi Outlander Sport: What’s the Difference? © 2019 NewSUV.org. All Rights Reserved.